We love drag race videos, and we know you do as well. We also love the sound of screaming engines, but every now and again we take some guilty pleasure in watching the instant-on torque of an electric motor cleaning the competition’s exhaust pipes. Don’t worry, we didn’t just spoil the outcome in this Tesla-versus-the-world video from The Fast Lane Car on YouTube. The action is actually pretty darned close, for the most part anyway. In this case, world means exactly two vehicles. The first is a 2019 Mercedes-AMG CLS 53, packing a boosted 3.0-liter inline six good for 429 horsepower (320 kilowatts) and a published 0-60 time of 4.4 seconds. 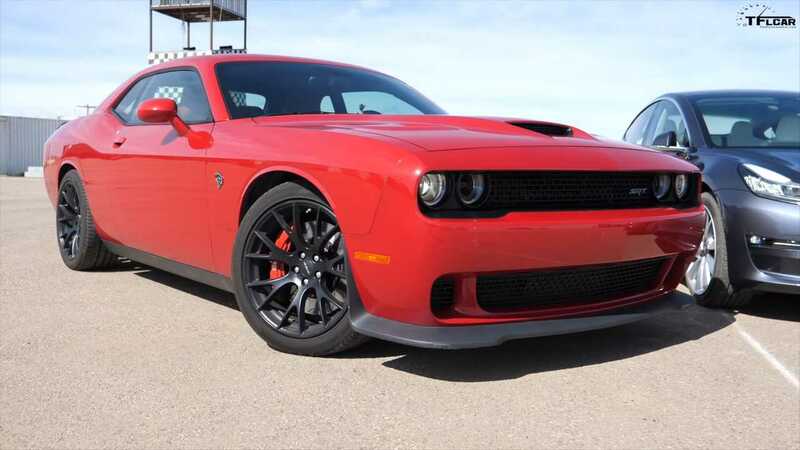 The second vehicle is a bit more intimidating, which can only mean a freaking Dodge Challenger Hellcat with its supercharged V8 ready to clobber everything. It’s a long-term tester with TFLC so it only has 707 hp (527 kW) under the hood, but traction willing it’s enough to shoot the devil child to 60 mph in just 3.4 seconds. Meanwhile, the Tesla Model 3 facing these petrol burners isn’t the higher-end performance model. It’s dual motors turn all four wheels with an estimated 367 horsepower and a Tesla-advertised 0-60 time of 4.5 seconds. Before the racing action began, testing gear was bolted into the Model 3 and sure enough, the electric car managed to click off a 4.59-second run to 60. The crew then did a Tesla software update that, among other things, was supposed to increase the car’s power by five percent. A follow-up test after the update showed that, yes, the car was a bit quicker with a 0-60 time of 4.42 seconds. On paper, the Tesla and Mercedes should be a good match but the Hellcat should absolutely rule them all. There are two critical factors against the fossil-fuel machines, however. The matchup takes place at over 5,000 feet in elevation, meaning the Mercedes and Dodge will lose a bit of power in the thinner air. Also, the race takes place at IMI Motorsports Complex north of Denver, which doesn’t have a dedicated quarter-mile drag strip, or even much straight-line tarmac to play with. In short, the deck is stacked against the Hellcat. We’ve seen time and again just how quickly Teslas can launch, but can it really overcome the Challenger packing double the horsepower? We will let the video tell the story; jump to 14:45 to see the racing action, starting with the AMG.